Now that we’ve learned the basics of a monocular, let’s explore some of the products available on the market today. Our monocular reviews will help you understand what it is you’re looking for. But if you still have some questions then be sure to continue to our buying guide for all of the information you need before buying! It’s always useful to have a monocular that is waterproof. Of course, that doesn’t necessarily mean that it’s going to take a swim and be okay but the Leico 8×20 should withstand most weather thrown at you. This means that you don’t have to stop what you’re doing when it starts raining and your vision will remain unobscured since it is nitrogen filled and therefore fogproof. As you can probably tell, this is a very rugged, durable product and it doesn’t stop there. The lens of the monocular has a coating that is water and dirt repellant. 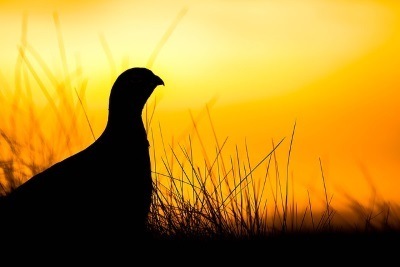 No wonder we consider this to be the best monocular for hunting and bird watching! Of course, it’s not all about the durability of the product (though that is important). The dimensions of the Leica 8×20 are 3.9 x 1.5 x 1.5 inches. This makes it small enough that it can easily fit in your pocket which is very convenient. What’s more, it weighs only 4 ounces so it’s a very portable product that won’t hinder you in any way. 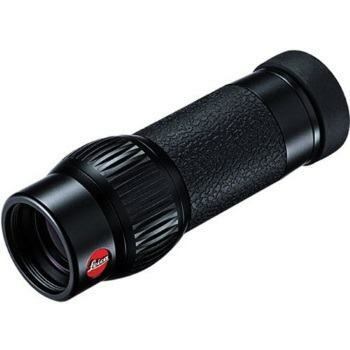 To top it all off, this monocular offers great optics. Even at the maximum 8x magnification, images are surprisingly clear. We really like that it’s an easy product to use which just makes it even more convenient. Granted, it’s not the cheapest monocular on the market. But overall, we think it’s well worth the price. If you want proof that monoculars can come in all sorts of sizes, take a look at the Bushnell Legend Ultra HD. 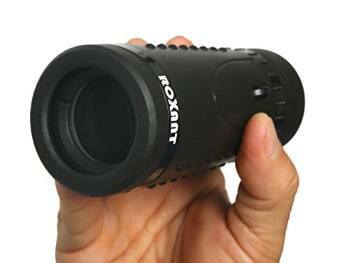 With dimensions of 4 x 4.6 x 6.5 inches, it’s not the smallest monocular on the market. In fact, at 10.4 ounces it’s not the lightest either. However, it’s still small and light enough to be portable. What it does offer is impressive optics for the price with as much as 10x magnification. The ED glass and fully multi-coated optics provide clear, bright images for when you’re trying to spot a rare bird or your favorite player at a sports game! Like all good monoculars, this product is waterproof and fogproof so you can use it in various conditions without any problem. We all appreciate some comfort so the twist-up eyecups are a welcome feature of this monocular. It’s also good to know that the product is easy to use with the focus being particularly quick and convenient. There’s alway the option to use this product in conjunction with a tripod for increased stability. If you’re looking for a good value product with great optics then we highly recommend the Bushnell Legend Ultra HD. When you see the price, you’ll understand why we feel that the Gosky Titan 12×50 is the best monocular for the money. This is a great, all-around product for all sorts of outdoor activities such as hiking, hunting and watching wildlife. 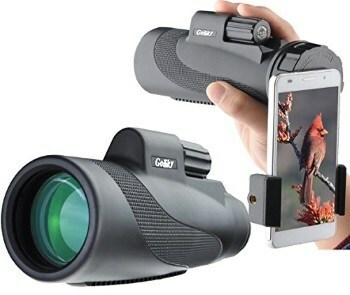 What’s particularly impressive about this monocular is that it offers 12x magnification. The objective lens measures 50mm and offers images that are fairly clear and bright. While the optics cannot be compared to more upmarket monoculars, they’re good for the money. As you may expect from a more budget monocular, it’s not as light as more expensive products. It weighs 13.9 ounces and has dimensions of 3.4 x 7.1 x 2.8. One of the most interesting features of the Gosky Titan 12×50 is the quick alignment smartphone adapter which is compatible with all of the latest smartphone models. This allows you to take photos and videos of what you’re looking at so that you can share the views with others! In general, we like the construction of this product which feels quite durable. The rubber armor provides some shock resistance while it also happens to be waterproof and dustproof. As such, it should last a long time. This product also includes a smartphone adapter, carry bag, eyepiece and lens covers, cleaning cloth and straps. While these aren’t of the very best quality, the fact that they’re included in the price is a big plus. You can’t get much cheaper than the Roxant Authentic Grip scope. But does it offer good value for money? Well, with dimensions of 5.5 x 2 x 2 inches, this is a fairly compact scope and the weight of 7.8 ounces makes it a medium-weight monoscope. 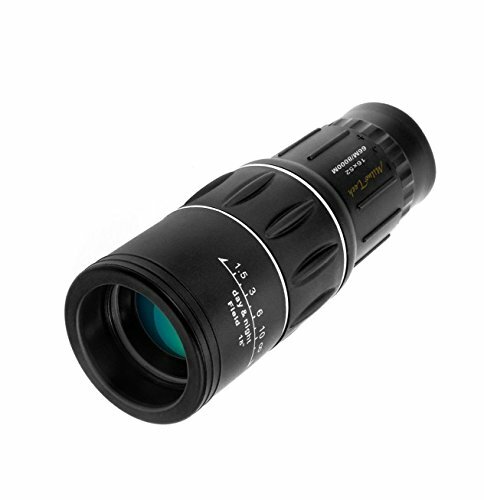 The fully multi-coated all glass lens offers good optics for the price though it only offers up to 6x magnification which may not be enough for some people. The exterior of the monocular is described as a no-slip comfort molded grip and it’s fair to say that this is quite accurate. It’s unlikely to slip out of the hand and it’s comfortable to hold. Despite the low price, this product does have some special features. It has a retractable eyecup which makes it much easier to use for those who wear glasses. Indeed, there’s plenty of eye relief on offer. What’s more, it comes with a few accessories including a carry pouch, cleaning cloth and neck strap. One thing that is missing is lens caps. This is an easy monocular to use since it’s not particularly powerful and thus doesn’t really suffer from wobble at its highest magnifications. Also, focusing is very easy. As long as you don’t mind having only 6x magnification, the Roxant Authentic Grip scope indeed offers good value. Another inexpensive budget option is the Miluo Tech 16×52 Dual Focus. At this sort of price, you can’t expect top quality but you may be surprised by what’s on offer. The optics of this monocular are multi-coated which makes images brighter. What’s particularly impressive is that it offers up to 16x magnification which is more than most monoculars on the market. However, the downside is that there is a real downgrade in visual quality on the highest magnifications and there is a great deal of wobble. But if you’re looking for a very compact, portable monocular, this is it. It weighs just 3.2 ounces and has dimensions of 2 x 2 x 5.7 inches which is surprising for the price. One of the main features of the Miluo Tech 16×52 is supposed to be the dual focus but this is something of a gimmick really. Regardless, it is an easy monocular to focus. In terms of the build quality, while it won’t compare to top of the range products, it does have a rubber armor exterior which provides a very secure grip. Despite the seemingly sturdy construction, it is not stated as being waterproof or fogproof. This shouldn’t prove much of a problem since the product is so cheap that you can use it without having to worry about damage. So you’ve decided that a monocular is the right choice for you. Whether you’re buying a monocular for hikes, birdwatching, hunting or to concerts of sports games, you’ll find our buying guide very helpful. Here you can learn about the advantages of monoculars over binoculars, the most important features and more! Monoculars and binoculars are both great options when you want to magnify a particular object or image. But why should you choose a monocular over a pair of binoculars? Well, while binoculars tend to be more powerful, the monocular is much smaller and lighter. In fact, they’re so compact that you can often fit them in your coat or trouser pocket. This makes monoculars much more convenient for anyone who needs to travel light when on a long hike or hunt, for example. What’s more, they’re easy to use. In terms of price, monoculars are fairly cheap to manufacture in comparison to binoculars so you can also get more bang for your buck. The amount of magnification you choose to have should really depend on what you use your monocular for. While it may be tempting to spring for a product that offers the highest possible magnification, this doesn’t actually mean much. In fact, some of the cheapest monoculars on the market offer more magnification as a means of enticing consumers. In reality, you’re unlikely to need a 12x or 15x magnification because the greater it is, the harder it can be to use since hand wobble comes into play. We recommend opting for a quality monocular that offers 6x or 8x magnification which will be more than enough for most people’s needs. Remember that the greater the magnification, the more the field of view is reduced. The coating on the lens of the monocular is important because it can help make images brighter and clearer. This is particularly useful in low light conditions such as early morning, late evening or simply when it’s cloudy. Thankfully, most monoculars nowadays have lenses that are multi-coated. This is even the case for many of the budget options on the market. The most popular and expensive option is ‘fully multi-coated’. These coatings are anti-reflective and they also tend to be waterproof which offers greater durability and longevity. A good, cheaper alternative is ‘multi-coated’ which are a little more reflective but still offer better images than the ‘coated’ and ‘fully coated’ options. Monocular lenses come in all sorts of sizes from 20mm to 50mm. The bigger the lens of your monocular, the brighter the image and, indeed, the wider the field of view. While you may not get as good a view from a smaller lens, they tend to be easier to use and much lighter. Also, just because a lens is big, doesn’t mean that it’s better quality than a smaller lens. If you’re buying a top of the range monocular with a smaller lens then it may comparable to bigger lenses on more mediocre products. So try to decide how much you value portability. If it’s not too important then opt for a bigger lens. If it is essential to you, feel free to go for a lens that is smaller and lighter. At the end of the day, there’s a monocular to fit everyone’s style! The main advantage of monoculars over binoculars or spotting scopes is that they’re smaller and lighter. But how much size and weight matters to you will determine which monocular you go for. Do you want something that is small enough that it can fit in your pocket? Or simply something that is sufficiently portable that you can squeeze it in your backpack? There are always solutions for better managing bigger, heavier monoculars. For example, many products include accessories such as carry bags. You may even wish to purchase a tripod so that you can spot objects with greater comfort. As we mentioned in the ‘lens diameter’ section, the size of the lens can also play a big part in the size and weight. The space between your eye and the eyepiece of the monocular, eye relief is particularly important if you wear glasses (or even sunglasses). Glasses wearers should look for at least 14mm of eye relief. This would mean that you can place your eye up to 14mm away from the eyepiece and still see the full image. Those who don’t wear glasses don’t particularly need to worry about eye relief. Another feature of monoculars that can affect eye relief are the eyecups, some of which are adjustable and, in some cases, removable. These are becoming more common in monoculars on the market today so take a look and see if you can find a product that offers you this additional flexibility. While the above 5 features are, in our opinion, the most important to be looking at, there are still a few other things to consider. 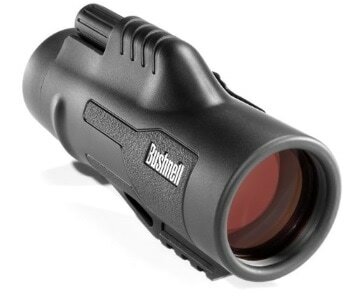 Hopefully, these will help you further narrow down the options and find a great monocular. If you’re planning on using your monocular in the dark then you may wish to investigate night vision monoculars. Most regular monoculars will not allow you to see in the dark though some can be useful in low light conditions. This is particularly the case when the monocular lens is fully multi-coated which produces a clearer, brighter image. Whether you’re planning on using your monocular on a boat or simply outdoors exposed to the elements, getting a monocular that is waterproof and fogproof is sensible. These tend to be more expensive but have become much more affordable in recent years. It’s better to be safe than sorry and this way you don’t need to worry about the weather. Our recommendation is that you take the time to shop around and compare different brands and models. A good place to start is by investigating our top monocular picks and seeing which fall within your budget. Features such as the lens size and lens coating can make all the difference when it comes to the total price. Accessories can also add extra value to a product but don’t put too much stock in these. When you’re investing money in a new piece of equipment, it makes sense to get a good warranty just in case! This should cover you from any manufacturer faults at the very least. The very best warranties are unlimited lifetime warranties which should cover your monocular in all sorts of scenarios. That way, you can use your new purchase in peace without worry. Accessories included with monoculars tend to be fairly cheap but can add value to the product you’re purchasing. Some of the accessories you can find included are: carry bag, lens caps, cleaning cloth, neck strap and so on. One thing that is very rarely included is a tripod. You’re unlikely to need this with a monocular but it can provide a great deal of stability when you’re using higher magnifications. Now that you have all of the essential information at your fingertips, we hope that you’re able to find the right monocular for you. Be sure to consider everything from the magnification to the lens size and think about what is most important to you. Whether you opt for power or portability may depend on what you use your monocular for. As you narrow down the options and make your final decision, consider our reviews of monoculars and buying guide. It’s great to see so many products on the market today to suit all levels of budget. What’s more, while competition and quality are increasing, prices are getting lower and lower. We’re confident you’ll find a great monocular product as a result!